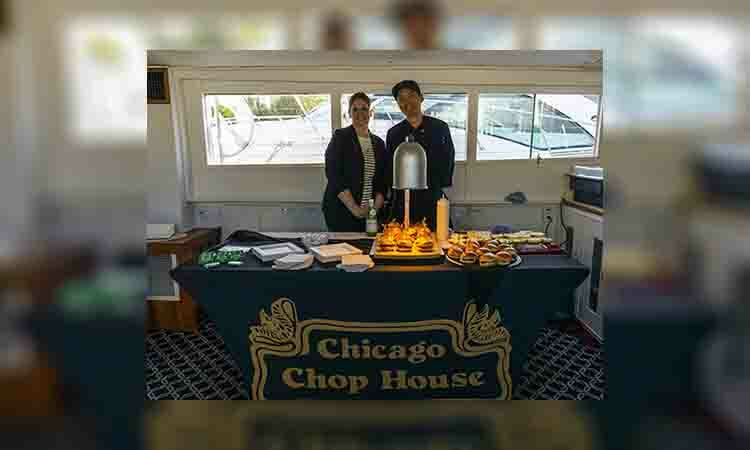 Always striving to provide the very best yachting experience, Chicago Private Yacht Rentals is pleased to have The Chicago Chop House as part of the Adeline’s Sea Moose family. An iconic steak and seafood dining establishment, The Chicago Chop House will offer a range of culinary delights catered to any occasion. Zagat Survey Rated “Excellent in America’s Top Restaurants” 1998, 1999, 2000, 2001, 2003, 2004, 2005, 2006, 2007,2008, 2009, 2010, 2011, 2012, 2013, 2014, 2015, 2016, 2017, The Chicago Chop House is another ideal addition to our First Mate dining and catering options. The true taste of Chicago, The Chicago Chop House was founded by Henry Norton in November 1986 with Executive chef, William Farrahi leading the culinary charge and now you can enjoy the flavor of every bit this beloved oasis in a bustling city has to offer while you savor the fantastic views of Chicago’s skyline. From buffet choices perfect for larger gatherings to a romantic dinner for 2 to a full surf & turf course table dining, The Chicago Chop House food will truly delight you and your guests.